Silverio, W., J. Jaquet (2005). "Glacial cover mapping (1987-1996) of the Cordillera Blanca (Peru) using satellite imagery." Remote Sensing of the Environment 95: 342-350. The Peruvian area has many similarities to that of the Northwest. The paper gives a good review of the natural setting and history of glacier inventories there. 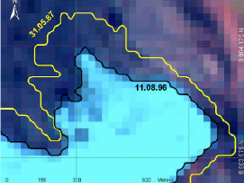 -The paper notes the use of Landsat 5 images from 1987 and notes that they have a “picture element” (pixel) resolution of 28.5m but in 1996 another TM image was obtained from L7 with a pixel resolution of 30m… why had it changed? Isn’t it the same sensor? Do I need to note this stuff in my work and how do I find it out? -The paper also discusses strong shadow effects (high relief) on the images that can be corrected through a topographic normalization using a DEM that must be 4 times the resolution of the image needing correction. Would the LiDAR DEM we have be able to help with this correction? Do we even need to worry about the correction for Hood & Rainier? They did say that the band ratio attenuates the shadow effect. -In this paper they use NDSI using bands 2 and 5… and even reference Hall et al. 1995 but If I remember right Hall uses 4 and 5 like we are using… this is confusing to me. Why do some papers use bands 2 and 5 just as we are using 4 and 5? -As in other studies they used color composite images to help determine glacier limits but then segmented the areas into debris free and debris covered areas and found threshold values they reported in the paper… but again, with band ratio 2 and 5. -The paper notes that Hall says that if measurements are considered during a relatively short period (a decade or so), errors are often larger than recession of the glacier; however, if the study period is longer, uncertainty will become smaller than recession. This is something to be aware of. A key takeaway point in the paper is that 30m pixel resolution imagery can be used for mapping of glacier recession during a period of two decades, and for a single decade with generally less accuracy. But ultimately, I’m still confused why they were using bands 2 and 5 rather than bands 4 & 5 like we are using. It seems that most papers I’ve read use 4&5… was it a misprint? The only explanation is that he references a paper where Hall uses MODIS data but in this paper he states “TM bands”. Engineering and Remote Sensing, 57(5), 531– 537. Thematic Mapper. Remote Sensing of Environment, 28, 9 –22. Hall, D. (2002). Monitoring Glacier Changes from Space. http://sdcd.gsfc. Hall, D. K., Bayr, K., Schfner, W., Bindschadler, R. A., & Chien, Y. L.
glacier positions in Austria from ground and space (1893–2001). Remote Sensing of Environment, 86, 566– 577. Sensing of Environment, 25, 311 – 321. Hall, D. K., Ormsby, J. p., Bindschadler, R. A., & Siddalingaiah, H. (1987). Landsat Thematic Mapper data. Annals of Glaciology, 9, 104– 108. TM 5 and ETM+ (TM 7) have the same spatial resolution. It was probably bad editing that resulted in this discrepancy. Shadow effects may be an issue. However, the shadows should be similar in each image since the images are collected with nearly the same solar illumination conditions each year. The only thing that should be changing is the glacier (and snow). I'm not sure about the 4x resolution requirement for the DEM and correction but I'll take a look at their paper again to see what they mean. They are using the NDSI that was developed for mapping snow. Others have shown that bands 4&5 are better. Band 2 has more atmospheric correction problems than band 4. Both show good contrast between glaciers/snow and non-glacier/non-snow areas.